If you’re a leader, you’ve probably heard the quote “Culture eats strategy for breakfast.” Unfortunately, when it comes to which one gets more attention from executives, it’s strategy, without question. This is perhaps because, to most executives, strategy is easier to manage. What many leaders fail to realize is that if they aren’t managing their culture, their culture is managing them. If you have any doubt as to which category you fall in, ask yourself this question, is your culture working for you, or against you? 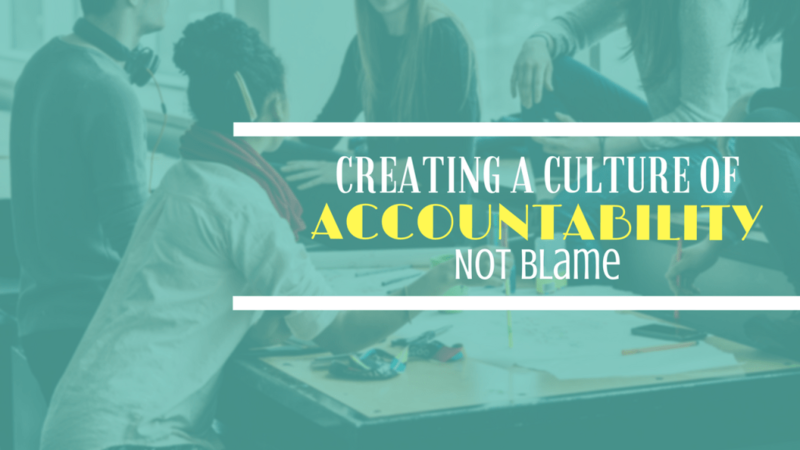 If you’ve ever felt like your culture wasn’t working for you, odds are it was a culture of blame. Blame is an accountability killer. Ironically, we live in a society that has blurred the lines between the words “accountability” and “blame.” In fact, many people use those words interchangeably. Leaders who don’t distinguish between the two are laying the groundwork for a culture that works against them. When people say “That politician must be held accountable for his actions”, what they’re really saying is “That politician is to blame and must be punished for his actions.” Accountability is not the same thing as blame or punishment. To be accountable means to take responsibility for results, good or bad. It means finding solutions to problems and applying lessons learned in order to improve future results. Being accountable is constructive because it focuses on the future. To be blamed, on the other hand, is to be accountable for culpable actions. Blame is often assigned before all the facts are known and assumes that people, not the systems they operate in, are the problem. Blame is focused on the past and on punishing the offender. The thinking behind assigning blame is that identifying the offender and punishing them will correct the poor behaviour. The reality is that the only thing people learn from being blamed is to become better at hiding their mistakes. 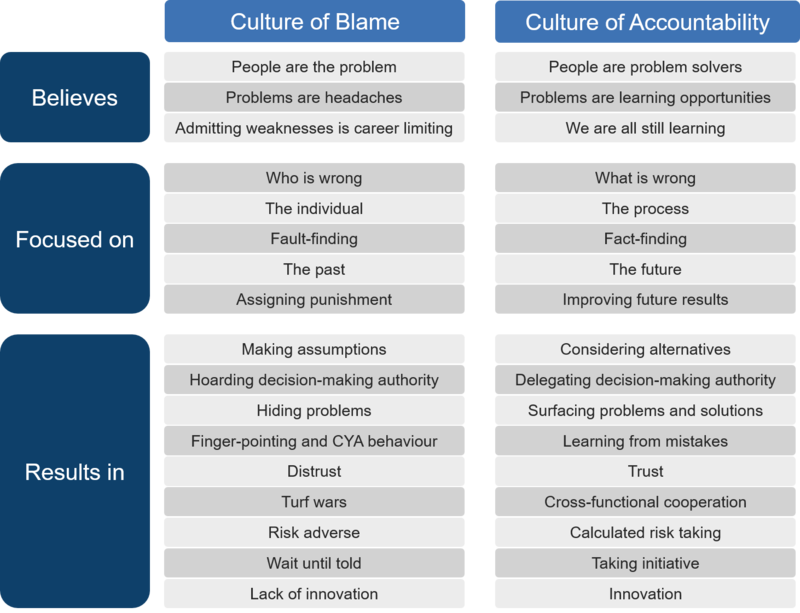 Cultures of blame are inherently inefficient. Countless dollars are essentially thrown out the window (think stacks of $100 bills) from the three self-destructive cycles that are put into motion as soon as someone in the organization is blamed. These three cycles are the Cycle of Inaction, the Cycle of Ignorance, and the Cycle of Infighting. The very act of blaming someone is a form of punishment. Its primary intent is to shame the accused. People tend to fear punishment and shaming, and fear is generally paralyzing. When a manager blames an employee for making a mistake, the employee tends to recoil into the safety of “wait until told.” Almost overnight, employees stop taking the initiative, and instead, bring all problems to their manager to await instructions on how the boss wants them to be resolved. This, of course, frustrates their manager. Employees sense their boss’s frustration with them, but aren’t quite sure why. This state of uneasiness causes once confident, competent employees to turn into mumbling, bumbling, mindless servants paralyzed by fear. Stephen Covey aptly named this cycle of behaviour “Gofer Delegation” because the boss ends up doing all the thinking and the employees simply carry out the boss’s orders. The fear of blame not only causes employees to lose confidence and shrink from action, but it also stalls their career development. Employees caught in the Cycle of Inaction tend to either stagnate in their careers, or they eventually leave so they can use their brain where it’s appreciated. The ostensible rationale for blaming someone is that if you sufficiently rub their nose in their mistake, the offender will think twice before making the same mistake again. Studies (and common sense) have proven otherwise. Instead of making fewer mistakes, people in blame and shame cultures simply get better at hiding their mistakes. Meanwhile, executives are oblivious to what is really going on in the trenches. They aren’t getting the results they want, but they don’t know why. So they aimlessly introduce new incentives or quality programs hoping this will change things. The real reasons for the poor results remain obscured and no learning occurs. The new ‘fixes’ cause an onslaught of unintended consequences and produce more problems, which people try to hide. they won’t be able to access help from their ‘enemies’ – people who would otherwise share their knowledge and resources. The more that people engage in blame wars, the more unresolved problems will pile up, which in turn increases the need to deflect blame onto others. The following eight practices lay the foundation for creating a culture of accountability. Delegate effectively. This includes taking the time to clearly articulate the desired results in writing, specify the delegate’s decision-making authority, provide required resources, and provide regular feedback. 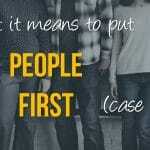 Most, if not all, problems would be mitigated if leaders followed this pattern of delegation. View problems as learning opportunities. The Kaizen Institute has a saying “Where no problem is perceived, there can be no improvement.” Never forget that we are all still learning to do our jobs better, and we learn best from our mistakes. Most importantly, make sure the people you lead know that you hold this belief. Lead with inquiry. Don’t assume you have all the facts. When you ask questions with a sincere desire to learn, you are less likely to provoke a defensive reaction. Remove emotion. Feedback and guidance turns to blame the instant the person on the receiving end perceives angry and frustrated tones. Even if the anger isn’t directed at the person accountable for the results, they will likely interpret the emotion as blame. Additionally, emotion interferes with the brain’s ability to problem solve and think logically. Focus on the problem and solution, not the person. Focusing on the issue or problem, not on the person, creates an open, trusting, communication-rich environment. Look for breakdowns in the process. Flawed systems, or processes, contribute to most workplace problems. We tend to assume that the cause of problems happened right before and in the same vicinity where the problem occurred. Think beyond the obvious to discover contributing factors separated from the problem by time and proximity. 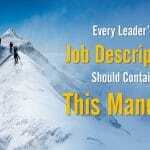 Poor leaders ask “Who’s at fault?” Strong leaders ask “Where did the process break down? Act like a leader. When things go right, good leaders deflect the credit. When things go wrong, good leaders take all the responsibility. 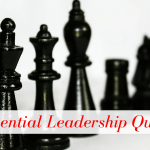 That’s tough, but that’s the price of admission to leadership (or rather, it should be). It’s just a shame that most people in leadership positions didn’t get that memo. Ask yourself “How did I contribute to this problem?” If you are part of the same system in which the problem was discovered, your actions probably had a role in the situation. Asking yourself this question will help you apply all the other seven accountability practices. Awesome information it is surely. We have been awaiting for this update.